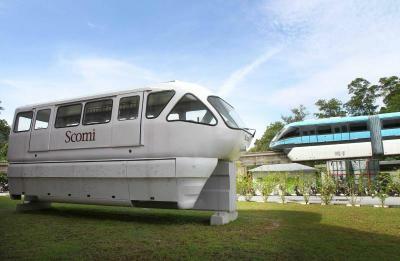 THE RM494mil Kuala Lumpur Monorail fleet expansion project is right on track with the production of a new generation of four-car monorail trains already underway at Scomi Rail Bhd’s Engineering, Technology and Innovation centre in Rawang. This expansion project is part of the Government Transformation Programme’s plan to improve public transportation. Named Sutra, which stands for Urban Transit Rail Application, the new trains comply with international standards and is a green project according to Scomi Engineering (Rail) president Suhaimi Yaacob. Huge space: Visitors at the tour and briefing of the factory. “This Generation 2 type of monorail train we are manufacturing has various advantages over the older trains that are currently being used on the KL Monorail. This includes a more competitive pricing and increased passenger comfort,” he said, adding that the RM1.846bil Mumbai Monorail project has an order for 15 of the four-car trains. The new trains raise the capacity of the current trains from 100 passengers per car to 150 per car. “This translates to 6,400 passengers per hour per direction. The G2 cars also feature couplings for up to eight cars that have a capacity of 1,050 passengers,” he said. Suhaimi pointed out that the new cars are made of aluminium, compared to the steel in current trains and this makes them lighter and contributes to easier maintenance. Finishing touches: The G2 type monorail that is in the process of being completed. “The Sutra trains on the Mumbai Monorail will reduce carbon dioxide emmissions by 200 tonnes of a day because of their energy efficiency,” said Suhaimi. They will also be quieter than other modes of transportation because of the use eco-friendly rubber tyres on concrete beams that creates less noise and vibration while in operation. “We will be delivering the first two trains for the KL project by end of this year while the complete delivery will be done by the second quarter of next year,” he said, adding that the factory is capable of producing 500 monorail cars a year. He said that under the KL project tender, they have also undertaken the upgrading of all the stations, construction of a new depot and upgrading the electrical and mechanical systems. “The civil works, that is the physical upgrades at the stations is being done through a sub-contractor. As for our overseas projects, the work is done by our consortium partners,” he said, adding that the work will be completed by the end of August. Many may not realise that the monorail trains currently running on the KL tracks were manufactured in the same factory back in 1996. Scomi then proceeded to upgrade the facility and built another factory, which was completed in 2009, at a cost of RM30mil. In the same year, completed the prototype of the G2. “Right now, 30% of the material we use in manufacturing is locally sourced and we target to increase this to 60% by next year,” Suhaimi said. 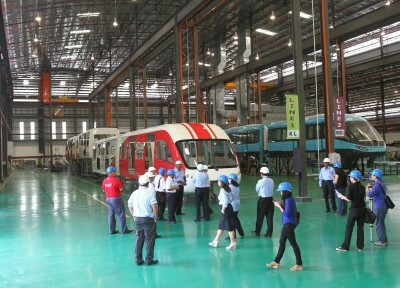 Currently, the Generation 3 and MRT-type trains are in development at the factory as future products. “One of the most obvious improvements for the future trains is increased capacity. 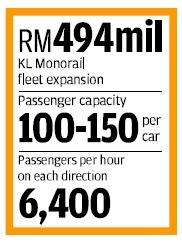 A four-car train will be able to seat 900 passengers compared to the current Putra LRT four-car trains that have a capacity of 740 passengers,” Suhaimi said, adding that the factory also has the facilities to produce bus coaches and special-purpose vehicles such as petrol tankers, aircraft refuelers, garbage compactors and desludging tankers. 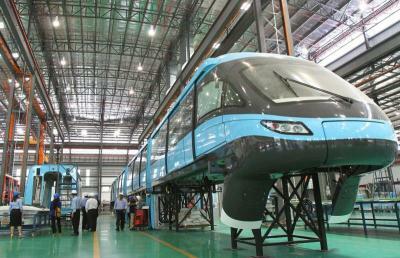 Out in the open: The latest G2 monorail (blue) is being tested on the kilometre-long test track at the factory while the first generation type monorail model stands in the foreground. The company is also one of only four globally to be recognised as a integrated monorail system provider. “This means that apart from manufacturing rolling stock, we also provide services such as communication systems, system integration project management and such,” he said. Scomi, along with its consortium partners, was also awarded two tenders last year in St Judas and Manaus, both in Brazil, worth RM2.6bil (for 24 three-car train sets and 18 stations) and RM2.76bil (for 10 six-car train sets and nine stations), respectively. They have been receiving recognition by city planners around the world and were recently awarded world-class certification for quality management systems (ISO 9001:2008), occupational health and safety management systems (OHSAS 18001:2007) and environmental management systems (ISO 14001:2001).